When life gets busy, overwhelm often takes over and spoils our productivity party. But only if we let it. There’s usually two reasons overwhelm shows up, and they’re connected. 1) We’re working hard on something worthwhile, so 2) we set self-care to the side in the name of making progress. It’s understandable, but it’s counter-intuitive.Yes, overwhelm can be positive. It happens because you’re working on those opportunities. So, when it shows up, pause and get present to why it’s happening, and do what’s necessary to stay on track. Fuel the good work by prioritizing self-care. For more thoughts around this, watch the video below or read the transcript that follows, and find the opportunity in your overwhelm. 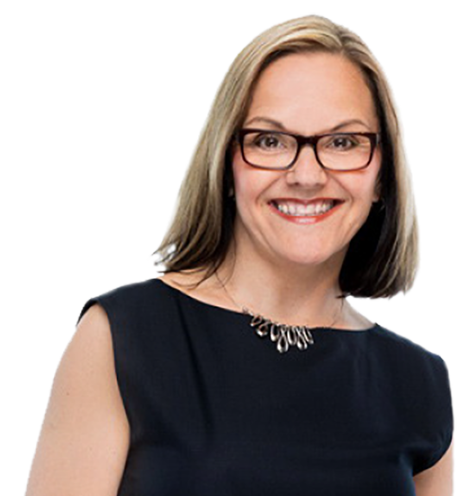 Hey, Michelle Cederberg here pausing to talk to you about busyness. I don’t know about you but I’ve been having a lot of conversations lately with my clients, with my colleagues, friends, family, and my audience members around busyness and this feeling that the pace of life is just ramping up, and sometimes it feels like we just can’t stay on top of it. If you ever feel like that, I just want you to pause and ponder your schedule. Ponder all the things that you take on in a day, all the things that you say yes too, all the things that you’re responsible for. How far are you stretched and and here’s the clincher, what’s causing it? Now you may be saying, “Well I have to work and I have to do all these things,” and part of our busyness is certainly the things that we’re responsible for, but in many ways, if we could simply become present to our schedules and the things that we’re saying yes too, we could better manage overwhelm. Life is going to happen every single day whether we think about it or not, but it’s worth thinking about, and here’s why: the world in all of its craziness and chaos and technological connectedness is demanding more from us than it ever has, physically, mentally, and emotionally. Think about the way that technology takes over our lives these days, it’s connecting us 24/7, it’s distracting us, and disconnecting us from real interactions. There’s a lot of good that comes from it, but there’s a lot of things we need to be mindful of. Technology also gives us an inundation of news from around the world, and a lot of it’s not good: politics and war, and poverty, racism, terrorism, and climate change. Some days it can be so depressing to be connected. All of that in addition to just trying to live your life, raise your family, care for aging parents, get to work, deal with longer commutes and longer work days, try to fit in fitness, and try to have a little down time. The word that comes to mind is capital O, Overwhelm, which brings about feelings of tension and stress, and that’s not fun for anyone. 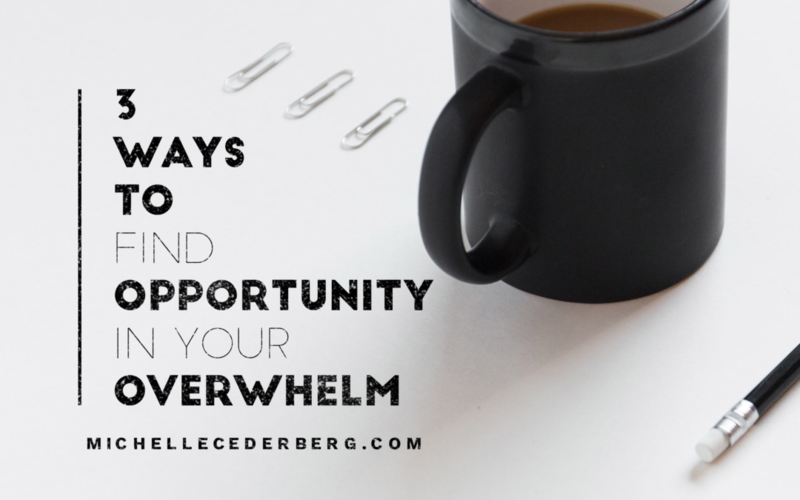 But it seems to be a part of our lives so I thought I would share three ways to shift from overwhelm to opportunity, and to feel a little less stress and a little more joy. Sounds good to me, so number one and boy it’s a tough one for people, is to pause and recognize overwhelm when you feel it. We can push through, push through, push through, but it’s not always going to serve us. Recognize when you feel overwhelm and identify why. Yes it could be because you’re working on a big project (more on that on a moment), but more often than not we add to our overwhelm because we’ve got too much screen time and not enough family time, because we’re saying yes to things when we should be saying no, because we’re skipping that break, because we’re not exercising, because we’re not being mindful of what we need physically, mentally and emotionally. You can’t ride that overwhelm wave indefinitely. At some point, you’ve got to breath, pause, and think about what’s causing that overwhelm, which brings me to number two. Overwhelm is not always a bad thing. When you feel overwhelm, look for the opportunity that’s connected with it. When we’re working hard towards something good that can bring overwhelm and so, for you, when you feel that overwhelm, yes recognize what you could be doing better but also recognize the win that is contributing to that tension. Right now I’m feeling overwhelmed because I’m working really hard to finish book number two in the next few months. It means I’m getting up early, it means my brain is constantly processing information, and I’m having to dig down and prioritize my work. It’s a good thing and I’m excited about it, and it’s overwhelming. But, I want to recognize the opportunity that’s connected to that overwhelm because somewhere between those two things, somewhere between overwhelm and opportunity, you’ve got two choices that will make or break success. The first is that you could curl up in a ball and let overwhelm win, and if you’re not taking care of yourself physically, mentally, and emotionally, the likelihood of that happening goes up. Or, you can lean towards the opportunity and double down your efforts… with one adjustment, which brings me to number three. All of those self care tactics, all of those mindfulness moments that we push aside when life gets busy, we’ve got to hold on tight to those things so that when we get into that overwhelm, we have the capacity to lean towards the opportunity. Remember that overwhelm shows up because you’re working towards something good. Don’t let overwhelm win. Choose to sleep more, choose to text less, exercise more, say yes to the right things, make sure you get the right kind of fuel and take the types of breaks that you need. Feed your productivity and push that overwhelm down just a little bit. Nurture opportunity. Overwhelm is always going to be in our lives and you have choices every single day about how you can manage that space between overwhelm and opportunity, and I hope what I’ve shared here today will give you some sense of what you’re capable of.Sky is the limit! Until next time, I’m Michelle Cederberg reminding you to take time for yourself in the midst of all the overwhelm. You’ve got one chance at this big fabulous life. I say #DaretoLiveItBig!